Where to Buy InVict AB Insect Paste, InVict AB Insect Paste Bait Insecticide - 5 x 1.25 Oz Syringe - $29.95 for Sale with Fast Free Shipping! 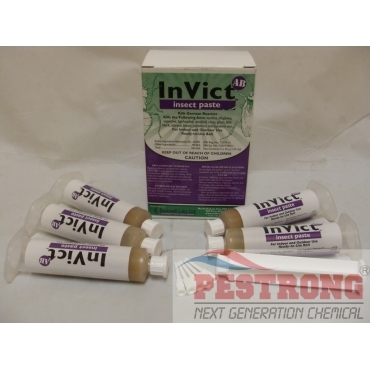 InVict AB Insect Paste Bait Insecticide - 5 x 1.25 Oz Syringe contains 0.05% Abamectin is a botanical insecticide and a range of sweet, oil, and protein attractants, but no peanut products. Studies show that it rapidly kills workers, queens and brood, eliminating the colony quickly. The paste formula can be used indoors, outdoors and in food areas. The special formula will remain attractive to ants and roaches for three months or more. Sold in boxes of five(5) 35-gram syringes with twist on applicator tips and a plunger. Use Sites: In and around structures, including, but not limited to, residential, multifamily,commercial, industrial, municipal, institutional, research, recreational, health care, educational, daycare, hospitality and agricultural buildings and other man-made structures, garages, transport vehicles, sewers, animal rearing and handling establishments and food service, storage, handling and processing establishments. Results will be best if spilled food and other debris are cleaned up before applying bait. Apply bait in small spots about ¼” in diameter. Bait can also be applied in thin lines, or films if appropriate. For most roach infestations, applications should range from 10 to 20 spots per 100 square feet. Use the higher number of spots when infestations are heavy and/or when roaches are living primarily in walls voids or other inaccessible areas. Smaller, more frequent spots are better than occasional large spots. In food areas, including serving areas while the establishmentis in operation, only apply bait in cracks, crevices, and other inaccessible areas, or in tamper-resistant bait stations. Follow above directions for crack and crevice placement. Avoid contamination of food and feedstuffs. Never apply bait directly to a surface where food is stored, prepared or served. Any bait that is left visible after treatment must be washed up. Apply bait on the outside surfaces of buildings and other structures, as well as in crawlspaces, attics, tree holes and other voids. Porches, garages, sheds, AC units and other outbuildings, fences or walls may also need treatment. Pay particular attention to cracks where insects may enter buildings and treat those areas. These areas include but aren’t limited to cracks around windows, doors, eaves and soffits, expansion joints, and areas where lines or pipes enter buildings. Under siding and molding are also attractive areas for insects to hide. Apply bait in spots, lines or films as indicated for indoor baiting. I had ants coming out of cracks of my bedroom and bathroom, so I got this ant poison and squeezed some of the pastes around the crack where the ants were invading from. Now I don't have any ants bothering me when I'm washing my face or crawling on top of my desk getting into my cups anymore, excellent product.